Sorry... the 2017 Nissan Armada is no longer being sold as new. Instead, take the first step to a great deal on 2019 Nissan Armada with a free price quote! With gas prices low and consumer interest in SUVs high, it's hard to think of a better time for Nissan to debut a redesigned version of its Armada full-size SUV. The 2017 Armada is now built on a body-on-frame platform that's shared with the Infiniti QX80 SUV. 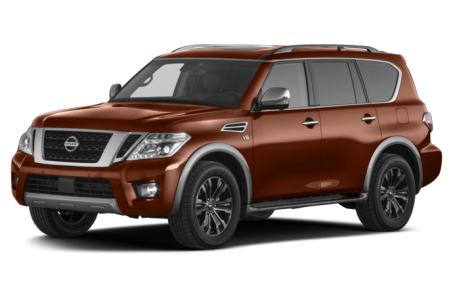 The Armada has room for up to eight people in three rows of seats and offers a number of active safety features. It's scheduled to hit dealerships this summer in three trim levels: SV, SL and Platinum, all of which are available with rear- or four-wheel drive. With its bulging fenders, vertical rear door handles and unique roofline arc, the prior-generation Armada took styling risks in a segment not known for them. With its redesign for 2017, many of those unique design aspects are gone, replaced by an SUV with smooth body sides and more traditional cues. The new front grille is an evolution of the prior Armada's, but it also resembles the one on the brand's Pathfinder three-row crossover. Standard features include LED low-beam headlights, LED daytime running lights, side steps and 18-inch alloy wheels. Options include 20-inch wheels, fog lights, a power moonroof, a power liftgate and rain-sensing windshield wipers. The standard three-row seating arrangement includes front buckets and a second- and third-row bench seat for a total of eight people. A seven-seat configuration with second-row bucket seats is optional for the top-of-the-line Platinum trim level. The base SV trim has cloth upholstery but the other models have leather. The Armada has a standard navigation system with an 8-inch screen, a Bose audio system that includes a subwoofer, Bluetooth cellphone connectivity and a backup camera. Additional standard features include power-adjustable heated front seats, push-button start and dual-zone automatic air conditioning. Options include cooled front seats, a power-folding third row, remote start, front and rear parking sensors, a power tilt/telescoping steering wheel, a surround-view camera system, adaptive cruise control and a rear-seat entertainment system with two 7-inch screens. In a departure from many redesigned models that weigh less than the cars they replace, the redesigned Armada is about 200 pounds heavier in base rear-wheel-drive form with a curb weight of 5,576 pounds. It does get a new 5.6-liter V-8 engine that makes more horsepower and torque; it's rated at 390 hp and 401 pounds-feet of torque. The V-8 drives a new seven-speed automatic transmission, which replaces the prior Armada's five-speed automatic. Official gas mileage estimates haven't been announced, but they shouldn't be far off the QX80's ratings, if at all. The rear-wheel-drive 2016 QX80 gets an EPA-estimated 14/20/16 mpg city/highway/combined while the four-wheel-drive model is rated at 13/19/15 mpg. When properly equipped, both the rear- and four-wheel-drive Armada are rated to tow up to 8,500 pounds. Optional for the SL trim level and included on the Platinum model is forward collision warning with automatic emergency braking, blind spot warning and backup collision intervention. The Platinum also includes lane departure warning and prevention.